PATEK PHILIPPE REF. 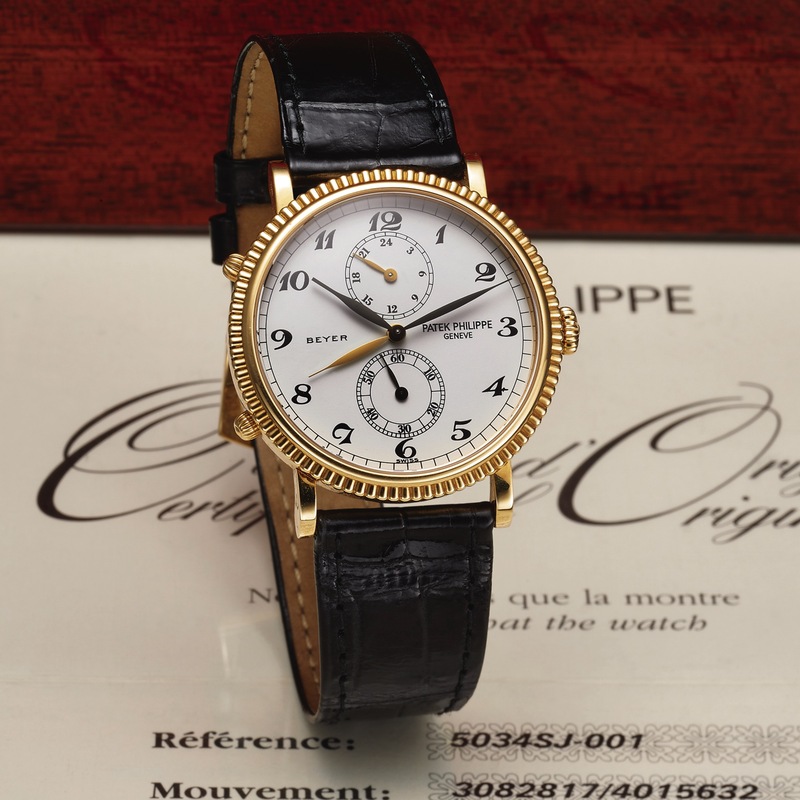 5034 TRAVEL TIME YELLOW GOLD RETAILED BY BEYER Patek Philippe, Genève, Travel Time, Retailed by Beyer, No. 3082817, case No. 4015632, Ref. 5034J. Sold October 12th, 2001. Very fine, two time zone, 18K yellow gold wristwatch with an 18K yellow gold Patek Philippe buckle. Accompanied by the original fitted box, Certificate of Origin and booklets. Two-body, solid, polished, stepped fluted bezel, straight lugs, sapphire crystals, the push buttons at 8 and 10 to independently adjust the hour hand for different time zones. White with printed Breguet numerals, outer minute track, subsidiary dials for the seconds at 6 and 24-hours for the second time zone at 12. Oxidized gold feuille hands, yellow gold hand for the second time zone. Cal. 215/156, stamped with the Seal of Geneva quality mark, rhodium- plated, fausses cotes decoration, 18 jewels, straight-line lever escapement, Gyromax balance, shock absorber, self-compensating free-sprung flat balance spring. C. Two-body, solid, polished, stepped fluted bezel, straight lugs, sapphire crystals, the push buttons at 8 and 10 to independently adjust the hour hand for different time zones. D. White with printed Breguet numerals, outer minute track, subsidiary dials for the seconds at 6 and 24-hours for the second time zone at 12. Oxidized gold feuille hands, yellow gold hand for the second time zone. M. Cal. 215/156, stamped with the Seal of Geneva quality mark, rhodium- plated, fausses cotes decoration, 18 jewels, straight-line lever escapement, Gyromax balance, shock absorber, self-compensating free-sprung flat balance spring. Dial, case and movement signed. DIAM. 34 mm. THICKNESS 8 mm.